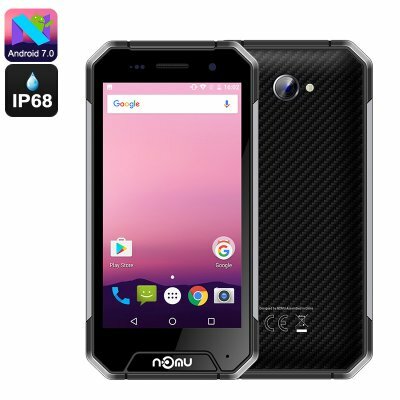 Successfully Added NOMU S30 Mini Android Phone - Quad-Core CPU, 3GB RAM, IP68 Waterproof, Android 7.0, HD Display, Dual-IMEI, 4G, 3000mAh (Silver) to your Shopping Cart. With a 4.7-Inch display, the NOMU S30 Mini is a compact Android phone that can be easily carried along anywhere you go. This smartphone features a fully rugged IP68 design. Thanks to this, it is resistant to water, dust, and drops. You will be able to use this rugged smartphone in the toughest of environments without ever needing to worry about accidentally breaking it. Even the phone’s HD display has been equipped with extra-tough Corning Gorilla Glass 3. Thanks to this, you’ll be able to enjoy your favorite media in crisp 720p resolutions while enjoying the outdoors. The NOMU S30 Mini rugged phone comes with a whopping 3000mAh battery. This cell brings forth enough juice to get you through the longest of days. With its Dual-IMEI numbers, Dual-Band WiFi, and 4G support, this Android phone treats you to great connectivity. Whether you’re at home, the office, or out in the wild – this Android phone will always keep you connected. Along with its Android 7.0 OS, it is guaranteed to treat you to a smooth user experience at any given moment. Within its compact body, the NOMU S30 Mini rugged Android phone packs a powerful Quad-Core CPU. Along with 3GB of RAM, this processor from MediaTek is capable of tackling the latest smartphone features available. Whether you’re into games, films, or Apps – this rugged Android phone handles it all. It supports 32GB internal storage and a 64GB SD card slot to keep all your files, media, and pictures. The latter can be snapped by yourself with the phone’s stunning 8MP rear camera that shoots breathtaking pictures and Full-HD video of all those special moments in life. The NOMU S30 Mini rugged phone comes with a 12 months warranty, brought to you by the leader in electronic devices as well as wholesale Android phones..